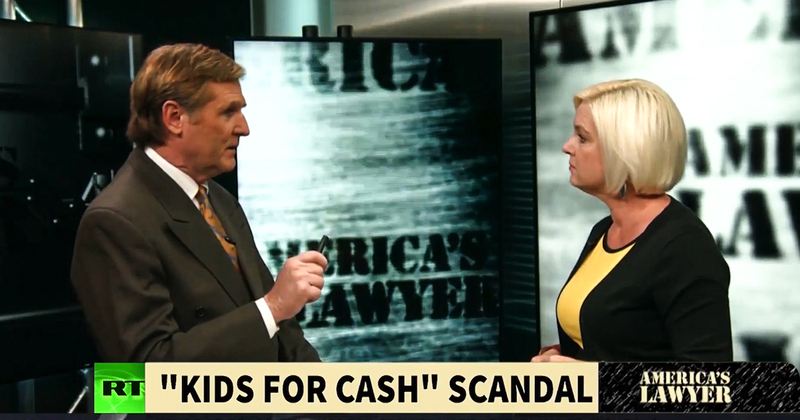 Via America’s Lawyer: Mike Papantonio is joined by Mollye Barrows, Legal Journalist for The Trial Lawyer Magazine, to discuss a re-trial for a Judge that imprisoned kids for money. Mike Papantonio:	A former judge serving 28 years in prison for accepting $2 million in kickbacks from imprisoning kids just had some of his convictions overturned. This has caused an outrage, especially among those who were victims of his kids for cash scheme. Joining me to talk about this is Mollye Barrows, legal journalist for The Trial Lawyer magazine. Mollye, first of all, give us a recap. What did this judge do? I mean, it was horrendous. Explain. Mollye Barrows:	It is horrendous. Back in the mid-2000s in Pennsylvania, he was basically part of a kids for cash kickback scheme in which he sentenced more than 3,000 students to juvenile facilities that were owned by a certain developer, one that was run down and then another one later that was built. Because he helped build it, he got kickbacks for that money. Mike Papantonio:	So, send the child to this jail. Mollye Barrows:	For-profit detention facility. Mike Papantonio:	Okay. Judge, for doing that, we’re going to pay you $2 million. Mollye Barrows:	Yes. Thank you so much for your brand of justice. These children, when you hear the stories, it is heartbreaking. Mollye Barrows:	I know this was 15 some odd years ago or a little over 10 years ago, but at any rate, these kids weren’t doing anything wrong necessarily or they were extremely minor infractions that they never should have seen incarceration time for. One child, one girl, in her teenage years, high school teenage years, had started a fake My Space account about a vice principal, and so that’s relatively harmless, no real harm was done. But when she went up before the court, it was part of this broader scheme of also not having the parents basically extorting or pressuring the parents not to have an attorney present. Mollye Barrows:	So, it was easier to violate their rights. Mollye Barrows:	… I’m tough on crime. Mollye Barrows:	I’m going to put these bad kids behind bars. Mike Papantonio:	Yeah. So these bad kids, when they’re behind bars, become much … They become real criminals. Mollye Barrows:	… for something similar to that. Mollye Barrows:	… put a marijuana pipe in his car. He got busted for it. They ended up before this judge and he was like, “Thanks for the opportunity.” Sent him off to a detention facility. He gets out, gets busted again for a minor traffic violation, back before the same judge, Ciavarella. He sentences him again to a facility, a detention facility. By the time he gets out, it’s this self-loathing spiral and he kills himself. Mike Papantonio:	This judge’s name is what? Mollye Barrows:	It’s Mark Ciavarella. Mike Papantonio:	Ciavarella. Remember that name. See, what we forget too often. I remember this story coming out. Media covered it a little bit. It’s gone now. We don’t even … Ciavarella, this is a character that … Now, some of the charges are being dropped. Mike Papantonio:	How is it going to affect his current sentence? I mean, if I look at it, he’s in there for a while because of multiple charges. Mike Papantonio:	How do you think this is going to affect things? Mollye Barrows:	Well, it’s going to be interesting to see because he was convicted on 12 counts and recently the court threw out three of those counts but upheld nine. The three that he basically threw out said that they needed to go back for a new trial and those were the most serious charges, which related to racketeering, as well as fraud, and money laundering. The charges that remain are for mail fraud, conspiracy to defraud the United States government, as well as tax fraud. Those sentences carry six to three years, six months to three years. So, the more serious charges, which is what has been dismissed, landed him the sentence that he has now. There’s 20 years left. Mike Papantonio:	Why don’t you write … It’s Judge Mark Ciavarella, right? Mike Papantonio:	Mark Ciavarella. You can probably … Where is he in a penitentiary in? Mollye Barrows:	He’s in Kentucky right now, Ashland, Kentucky, at a federal detention facility. Mike Papantonio:	Yeah. Write the guy and tell him what you think. Mike Papantonio:	We don’t do that enough, do we? Mollye Barrows:	Oh, I’m sorry. The statute of limitations is up, which is why the judge dismissed those charges. While your attorney should have brought up statute of limitations, you received the money five years before the charges were ever brought. But, you know, this is the same thing he did to these kids. Basically, he really did do something wrong now. Now he wants to pass, but he wasn’t willing to give a pass to these children that were unfairly sentenced. Mike Papantonio:	Yeah. I’m just betting … I think any judge looking at this would know that it is insane to take a chance on giving this cat a break at all. Thank you, Mollye.